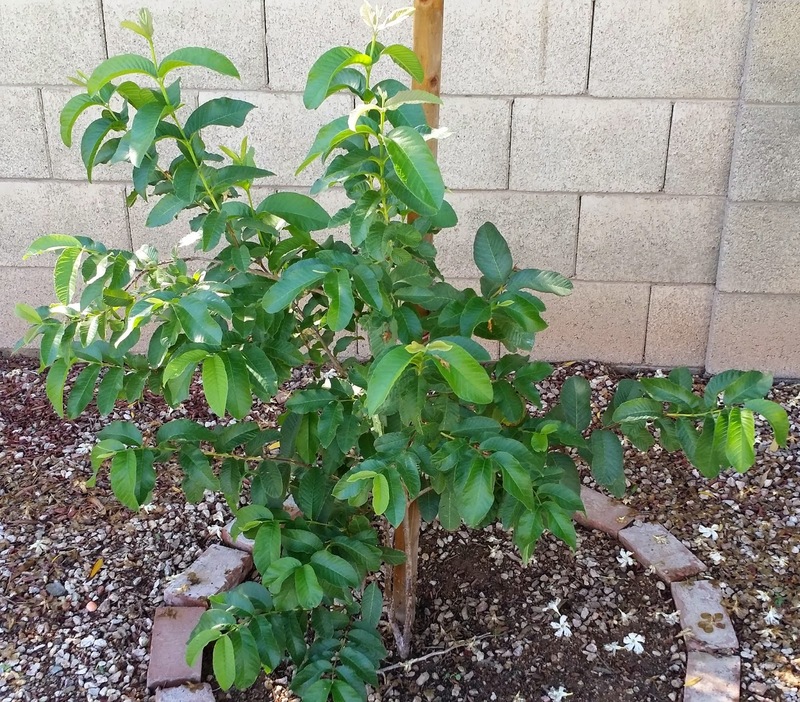 This is a Beaumont Pink Guava that I planted on 5 March 2014. Since then it's flowered twice but no signs of any fruit. I think that the reason that it's looking so healthy is that it's spent most of the summer in the shade of a lemon tree so hasn't suffered the direct harsh sunlight. I planted this Sugar Can Jujube on 5 March 2014. At that time it was a bare root "stick" with nothing on it. It's done a remarkable job of growing branches and today (30 September 2014) has a single fruit on it. It seems to be doing well even though it's been getting way more water than it should be because of its proximity to the grass that's getting watered. 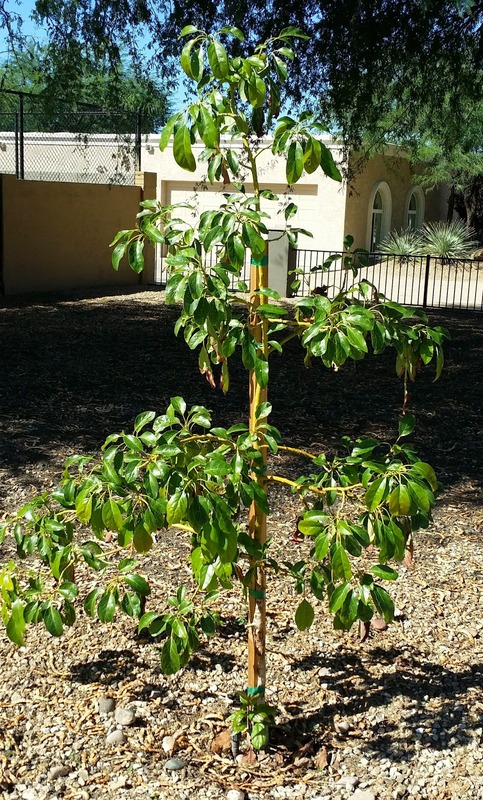 On 26 October 2013 we planted this 15 gallon Lamb Hass Avocado. I strategically selected a spot under the mesquite trees to provide it with morning sun and afternoon shade. This seems to have worked relatively well except that the Arizona sun still gave it a beating for a couple of months. A sunscreen would have probably been wise for those months. The leaves appeared to burn and died off. Luckily there's been new growth which seems to be keeping it healthy. The tree flowered profusely and fruit set on it in the spring. Only one avocado survived and it grew to the size of a large grape before shrivelling and dying. The desert cotton tails (I think it's them) appear to have nibbled at the trunk and one of the branches which isn't good. 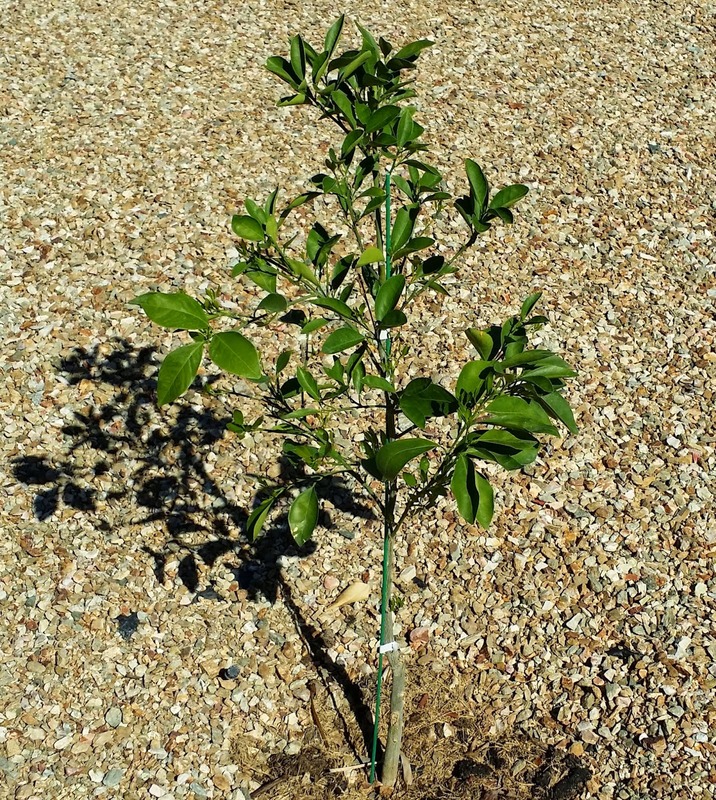 At the beginning of March 2014 this Seedless Kishu Mandarin went into the orchard. 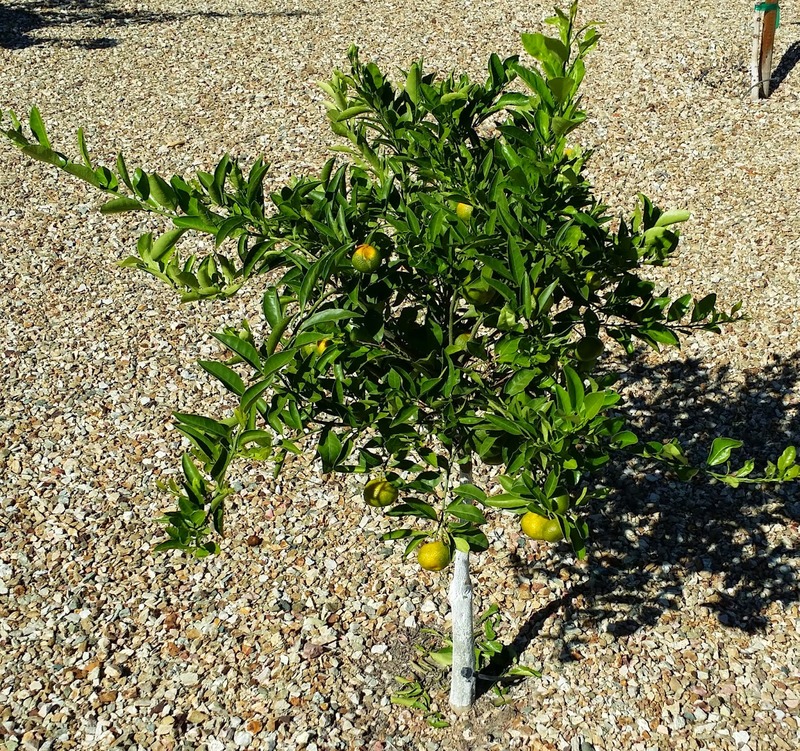 Out of all the citrus trees it is doing the best as it flowered and the fruit set and we now (30 September 2014) have around 30 mandarins on it which should be ready to eat soon. The label describes it as early maturing variety from China. Popular in specialty markets and landscapes. Excellent container specimen. Tree: Small size with round shape. Fruit: Very small. Light yellowish-orange rind. Easy to peel, seedless, mildly sweet. 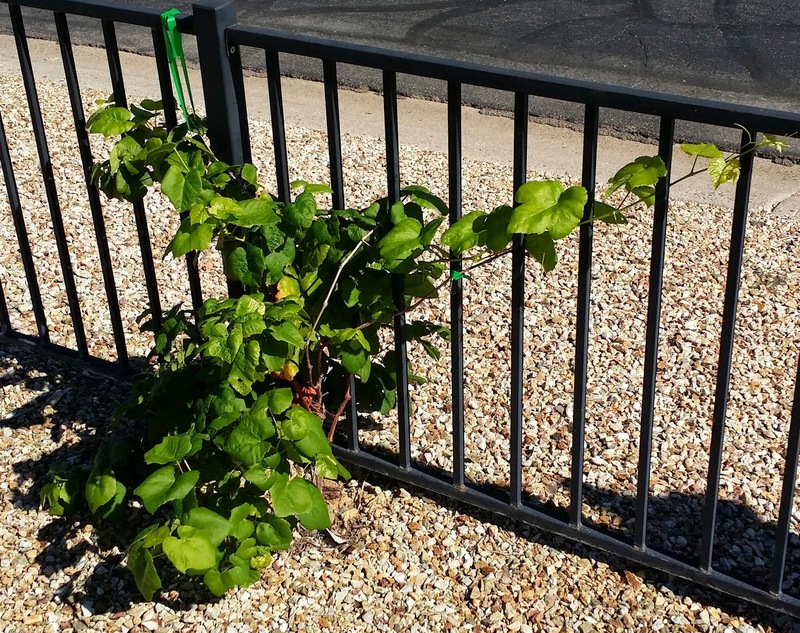 In March 2014 we bought 4 seedless grape vines. Black Monukka, Flame, Thompson, and Himrod. This photo shows one of them which is doing a good job of winding through the fence and will hopefully create a grapevine fence along our front yard. Two of the vines produced bunches of grapes over the summer but they were quickly eaten by birds or insects. We may net the vines next summer. 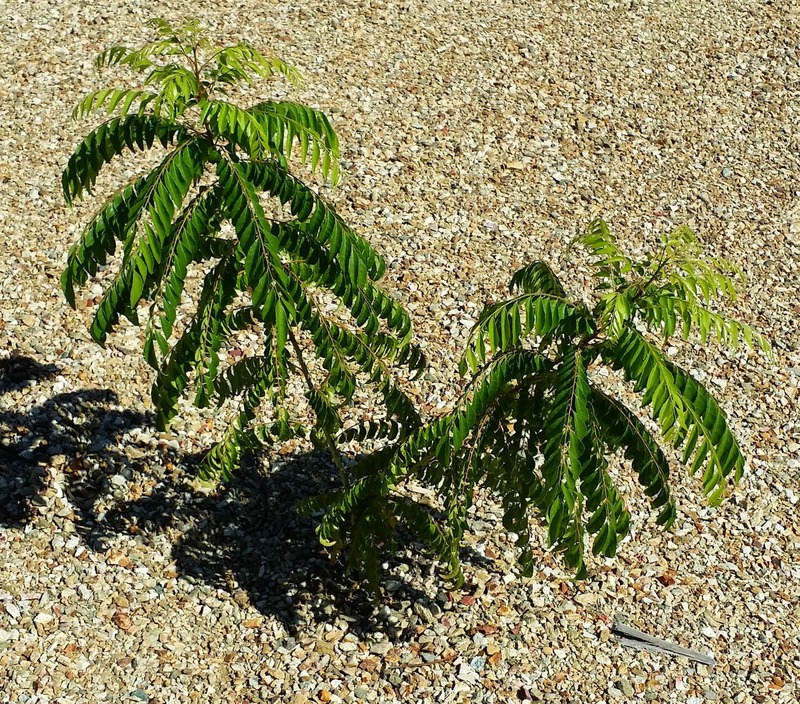 This is our Indian Curry Leaf tree. We got it in October 2013 and it was only about 5 inches tall. For the first few months it was under severe strain as the humans wouldn't head my advice and leave it alone. They kept on pulling off its leaves and using them in their cooking. 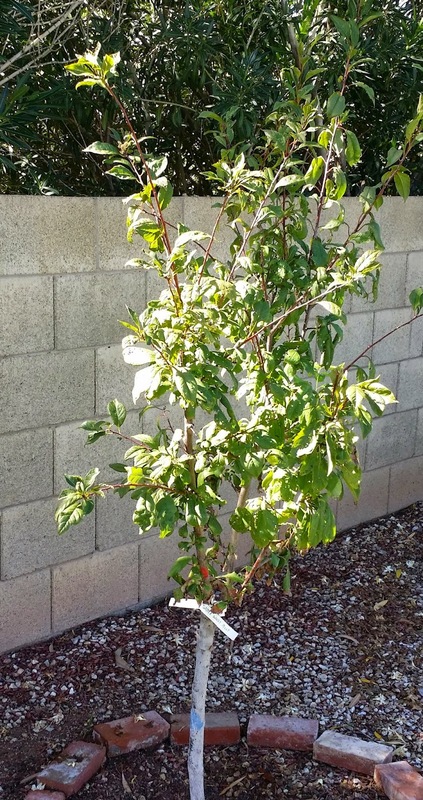 Luckily the tree survived and today (30 September 2014) about a year later it stands at 33 inches tall and has two branches. I expect it to lose its leaves over the winter but to regain everything in the summer. Last winter we covered it at night to help it survive. New tree in the orchard as of 18 September 2014 is the Cara Cara Pink Navel Orange from Willits & Newcomb Nursery via Costco. Described as having a distinct reddish-pink color the fruit is a medium size with a deep orange rind. The taste is much like the Washington navel orange. Fruit ripens mid-November into early March. The tree has a compact growth habit and may occasionally produce variegated leaves. Some limbs may bear normal orange colored fruit. The tree is currently 38 inches tall. At the time of writing this the tree has been in the ground for 12 days and there are already several new green shoots on it up to 2 inches long.